I spotted this bus beside the City Art Centre, on Market Street. Preparing to leave on a tour of Scotland, ‘The Travelling Gallery’ will be available in Edinburgh until Friday, 30th August. Parked in a space which made me think it must of been lowered in by helicopter (well done driver! 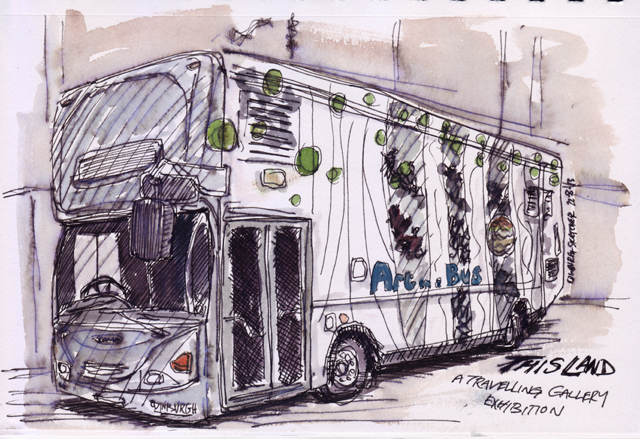 ), the bus is a custom-built, contemporary art space. Inspired by the Year of Natural Scotland, the Travelling Gallery’s autumn exhibition presents an alternative view of the Scottish landscape, through works by artists with a diverse range of practices. Supported by Creative Scotland, the Esmée Fairbairn Foundation and the City of Edinburgh Council, the Travelling Gallery brings art to schools and communities throughout Scotland. The dates in Edinburgh and then further afield are below. Do try and catch the show when it passes by, it is both thought provoking and beautiful. For more information about The Travelling Gallery visit their website HERE.